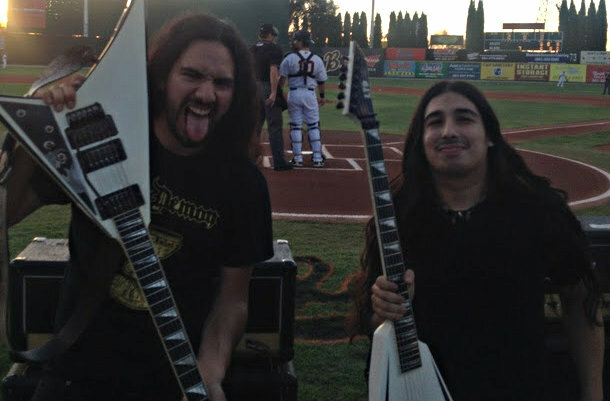 Heavy metal up-and-comers EXMORTUS decided to warm up for their current North American tour supporting ARSIS and ALLEGAEON by stopping by a home game of the Class A minor league baseball team Bakersfield Blaze to deliver a rousing, metallic rendition of the national anthem. You can watch guitarists Conan and David's shred-worthy performance below! Combining "thrash riffs, fretboard-searing solos and neo-classical technique" (OC Weekly), EXMORTUS' acclaimed Prosthetic debut, "Slave To The Sword", proved that the SoCal-based quartet are a force to be reckoned with. The road warriors have spent the past year barnstorming relentlessly throughout North America alongside such acts as FLOTSAM AND JETSAM, DARK TRANQUILLITY, DESTRUCTION, KRISIUN, HATCHET, OMNIUM GATHERUM and LICH KING. The group also took over the nation's airwaves with continuous radio play and features on SiriusXM's Liquid Metal along with a stint on national television appearing on a commercial for Virgin Mobile.